Anyone that creates a SkyDrive account right now gains access to 7 GB of free storage. You can use this space to store almost any type of file that you wish, and there are many ways to get those files to your SkyDrive account. 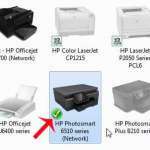 But if you want to learn how to upload large files to SkyDrive, then there is one method that you should use which is going to work better than the rest of the options available to you. 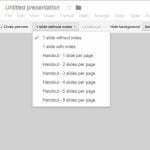 SkyDrive will place a file size limit on items that you upload through the Web browser interface, which makes it difficult to upload large files using that method. Luckily there is an app that you can download for your Windows computer that will increase the file size limit, allowing you to upload large files to your SkyDrive cloud storage account. 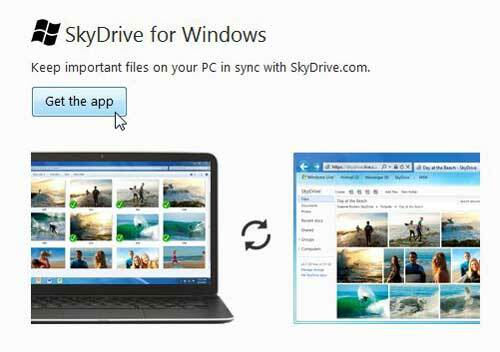 A lot of people use SkyDrive as a place to store pictures, music and documents that they might need to access from another location. The SkyDrive browser interface is ideal for this, because there are no extra steps to perform a file upload. Simply open a browser, sign into SkyDrive, and follow the instructions to upload your files. The web browser upload option features a single-file 300 MB size limit, which will cover the majority of single files that the average user will upload. But, if you use the Windows SkyDrive app, you can increase that file size limitation to 2 GB. Step 1: Open a Web browser window, navigate to the skydrive.live.com page and sign into your account. Step 2: Click the Get Skydrive apps link at the left side of the window. Step 3: Click the Get the app button under SkyDrive for Windows, then click the Download button on the next screen and save the file to your computer. Step 4: Double-click the downloaded file (it’s called SkyDriveSetup.exe, in case you are having trouble locating it), wait for the installation to complete, the click the Get Started button at the bottom-right corner of the window. 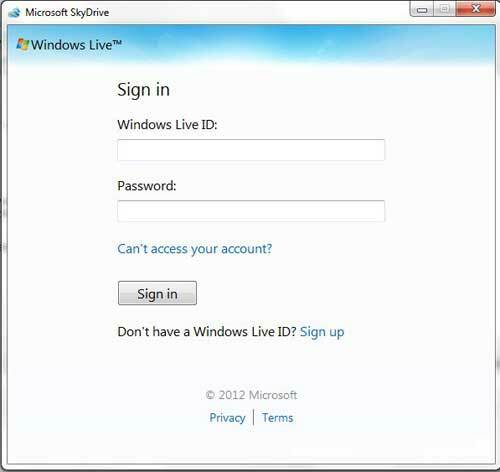 Step 5: Type your Windows Live ID and password into their respective fields, then click the Sign In button. Step 6: Click the Next button, then click the Done button. 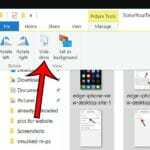 You will need to use the default options on both of these screens to upload large files to SkyDrive using the instructions in the rest of this tutorial. 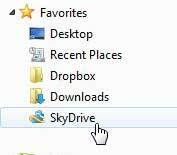 Step 7: Browse to the large file that you want to upload to SkyDrive, right-click the file, then click Copy. Step 8: Click the Windows Explorer folder icon in the taskbar at the bottom of your screen. Step 9: Click the SkyDrive folder in the column at the left side of the window to open the SkyDrive folder on your computer. This folder should already be starting to sync with your online SkyDrive account, so some of your SkyDrive files should already be visible. Step 10: Right-click inside an empty space in this folder, then click the Paste option. 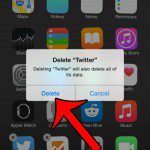 It will take a little while for the file to be uploaded to your Skydrive account, due to the fact that the file is very large and needs to be uploaded, but no other interaction is required on your part. Once again, note that the limit for files uploaded in this manner is 2 GB.